A few weeks ago the West ran a news story on a boat that broke loose off the metropolitan coast and was next seen, still in excellent shape, the other side of Madagascar many months later. It was a LeisureCat, and the voyage indicates that their reputation for strength and build quality is well founded. LeisureCat have never built a luxury boat; practical and effective better describe their products. Those adjectives are a perfect fit with the review Kingfisher 9000. 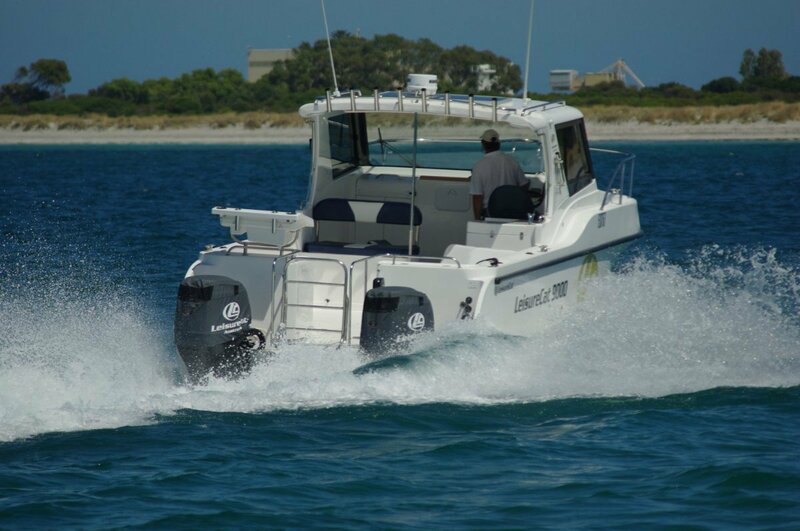 Inevitably, this boat will be primarily used for fishing – LeisureCats feature on most anglers’ wish lists – and it has been given a monster cockpit to suit the job. For any buyer wanting more accommodation, part of that cockpit can be sacrificed to an enclosed cabin. That said, the standard accommodation would satisfy most families’ wants for weekend jaunts, and dedicated fishers could live in acceptable comfort for extended trips. 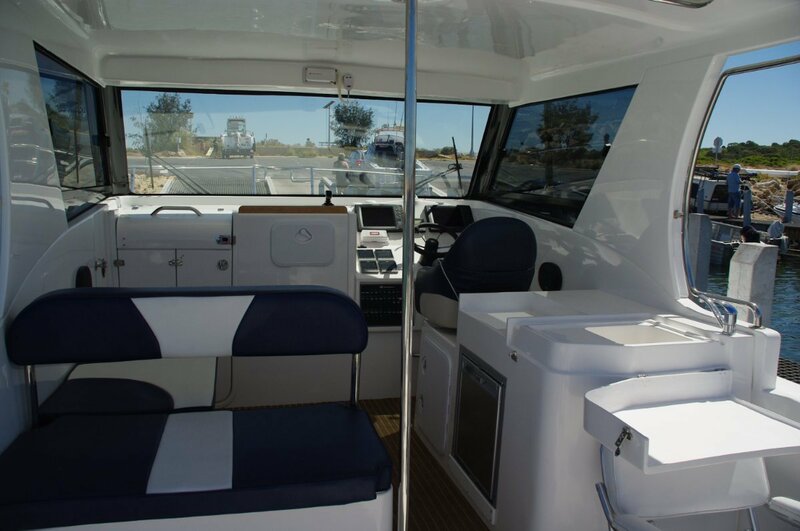 Under the foredeck is a double cabin and a flushing toilet – the basic necessities – and under the hardtop a kitchen-diner. The latter uses the space cleverly with movable seat backs modifying the seating layout to suit the occasion. The galley module aft of the driving position houses a locker, fridge and sink. Actual cooking is usually carried out aft on a drop-in barbecue. 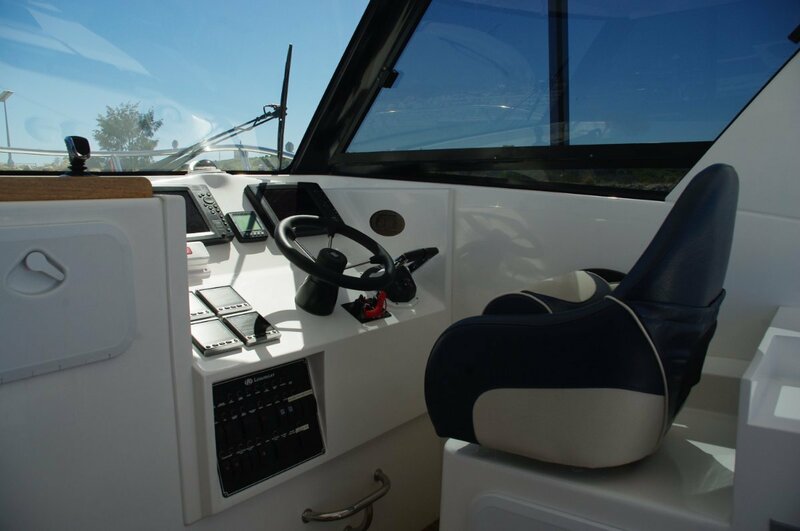 The driving position features an item seen for the first time on an outboard powered boat in the southern hemisphere: a joystick. This 9000 has been fitted with an Optimus 360 steering system that makes manoeuvring experts out of mugs. Computer controlled, naturally, the system features individual power steering pumps for each motor, allowing them to operate independently. Engage the Optimus and twist, push or pull the joystick to spin, move forwards, sideways or backwards. The motors shifting to varying angles with each other make a weird sight for those not in the know. The motors being so far apart on a cat already allow reasonable manoeuvring by using ahead power on one and reverse on the other. On twin outboard powered monohulls the differential power trick seldom works, but Optimus would cure that. Other refinements the system delivers include the ability to tighten the steering ratio when driving in confined waters. But unconfined waters are the LeisureCat’s natural stamping ground. The review day, in the early stages of a moderate sea breeze, offered no opportunity to put the hull under any kind of stress. But this is the hull form by which other cats are measured worldwide and so had nothing to prove under way. At rest it had the steadiness that only cats have, matching the sheer roominess of the breed. To cope with its wide open spaces LeisureCat have fitted abundant hand holds. All the fisherman’s wants are catered for from abundant rod storage to one of the finest bait stations afloat. Almost unlimited numbers of anglers can take advantage of the stability and line the many metres of rail. The cavernous under deck lockers have drop in moulded bins to cap the dry storage space with the locations for ice slurry or items like scuba gear. Diving is certainly in the 9000’s repertoire. Room to gear up, a deck shower for après dive, and a top means of getting in and out: a platform extends aft between the motors at deck level with the ladder lowering from its end. From time to time this is also a prized fishing position. Driving the 9000, using conventional wheel and throttle, is a delight. Standard power is from a pair of 250hp Suzukis and they take the 9000 well up into the 30s. No special techniques are needed: just open the throttles, get the trim right, and then play – or drive straight and serious if you do not feel frivolous. The hull irons out any bumps with ease. The tunnel has plenty of height to cope with serious seas, and is capped with a spine making two hemi sectioned sub tunnels to house air cushioning. The design has its imitators, but nothing to rival it has turned up in Australia. 9.6 metres by 3.1 is a lot of boat, but is trailable by the right vehicle – as the review boat was. 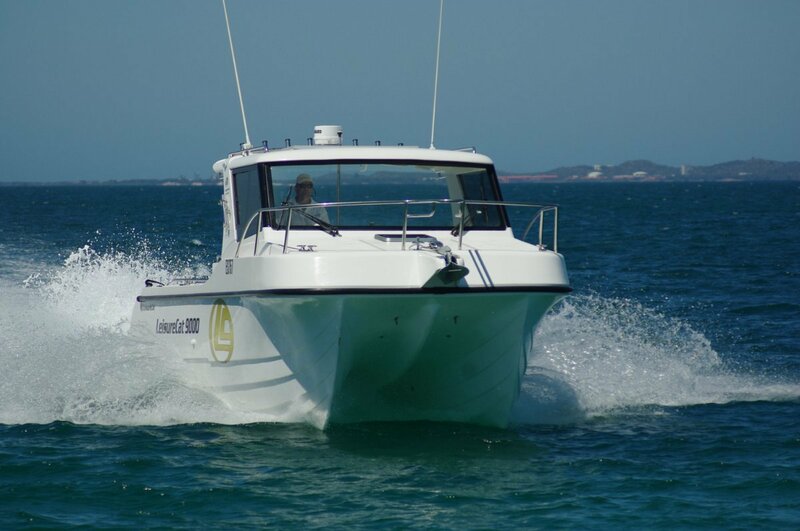 This is a huge advantage, saving pen and slipping costs, and giving the flexibility to use the boat anywhere along the coast.